Schinus is a genus of flowering trees and tall shrubs in the sumac family, Anacardiaceae. Members of the genus are commonly known as pepper trees. 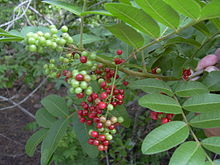 The Peruvian pepper tree (Schinus molle) is the source of the spice known as pink peppercorns. They can become an invasive species outside their natural habitats. Schinus polygama, although less well known, is also potentially weedy in mesic areas. The generic name is derived from the Greek word for Pistacia lentiscus, Σχίνος (schinos), which it resembles. There has been considerable historic confusion as to the correct gender of the genus name; as of 2015 this has been resolved with the determination that the correct gender of Schinus is feminine (rather than masculine), and adjectival names within the genus must be spelled accordingly. Over time there has been a fair amount of reclassification within this genus and earlier names may incorrectly continue to be used by those unaware of changes, including in some cases government departments and even textbooks. The name Schinus areira remains widespread, in Australia (the peppercorn tree) in particular, but this is now considered to be a variety of Schinus molle (var. areira). Schinus latifolia (Gillies ex Lindl.) Engl. Schinus terebinthifolia var. acutifolia Engl. Schinus terebinthifolia var. pohliana Engl. Schinus weinmanniifolia Mart. ex Engl. 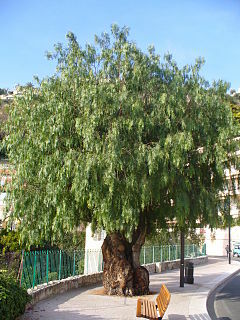 Wikimedia Commons has media related to Schinus. ^ a b "Genus: Schinus L." Germplasm Resources Information Network. United States Department of Agriculture. 2009-11-23. Retrieved 2011-02-22. ^ "Schinus L." TROPICOS. Missouri Botanical Garden. Retrieved 2010-02-09. ^ Seidemann, Johannes (2005). World spice plants. Springer. p. 337. ISBN 978-3-540-22279-8. ^ Allen, Gary (2007). The Herbalist in the Kitchen. University of Illinois Press. pp. 26–27. ISBN 978-0-252-03162-5. ^ Quattrocchi, Umberto (2000). CRC World Dictionary of Plant Names: Common Names, Scientific Names, Eponyms, Synonyms, and Etymology. IV R-Z. Taylor & Francis US. p. 2405. ISBN 978-0-8493-2678-3. ^ a b "GRIN Species Records of Schinus". Germplasm Resources Information Network. United States Department of Agriculture. Retrieved 2015-07-22.